The new Maruti Ertiga 2018 has just launched in India Priced at a good range of Rs.7.44 lakh to Rs.10.90 lakh. 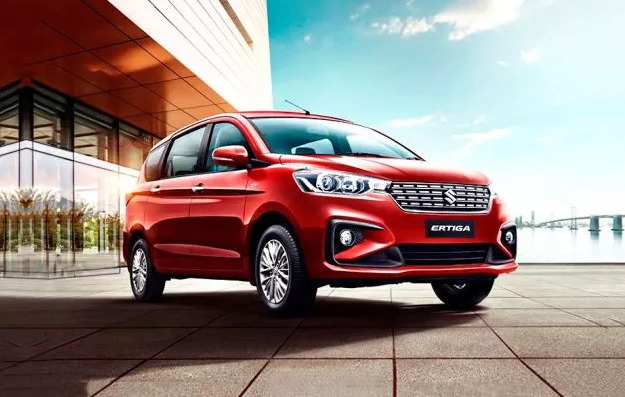 The second-generation Maruti Suzuki Ertiga is launched with a redefined bold design, new styling and few updated features and equipment. Based on the company’s existing platform HEARTECT, the new Ertiga is longer, taller and wider. It offers larger cabin space as compared to the older model. Apart from the overall design and cosmetic uplifts, this MPV now is now also available in the new 1.5-litre petrol engine that which powers Maruti Suzuki Ciaz. The bookings for new Ertiga opened earlier this month. The design of new Maruti Suzuki Ertiga makes it look like a smaller version of Innova Crysta. This latest car is equipped with bold chrome pixel grille, large projector headlamps with LED DRLs, aesthetically enhanced alloy wheels, bold character lines and LED taillamps. The new Ertiga also has a swankier cabin and smart interior. Inspired by the company’s other new-gen cars, maruti Ertiga 2018 also features a new infotainment system with Apple CarPlay and Android Auto for connectivity. The new Ertiga also promises safety to its customers with uplifting and improvising safety features. Like most other new Maruti models, Ertiga will also have dual airbags and ABS with EBD as standard. The automatic versions will also come with ESP and Hill Hold function for better safety. This new Maruti Suzuki MUV comes in both petrol as well as a diesel variant. The two engine options available are 1.3-litre diesel and an all-new 1.5-litre petrol. Both the engines ensure high performance resulting in better fuel efficiency. Engines are well equipped with Smart Hybrid Vehicle by Suzuki (SHVS) technology. With the new Ertiga, the SHVS technology would be available in petrol MUV for the first time ever. Ertiga petrol will also get a dual-battery setup very similar to the one in new Ciaz. The vehicle is powered by conventional lead-acid battery and the idle start-stop tech. An external lithium-ion battery is implemented for torque assist, which will be located under the front passenger seat. The diesel version of New Ertiga will continue with the single-battery setup for the SHVS system, just like the previous version of diesel Ertiga. The new Ertiga is taller longer and wider than its predecessor. It is longer by 99 mm, wider by 40 mm and taller by 5 mm. The third row of this version is upright which subsequently increases the boot space by 50 percent. With the implementation of mild-hybrid system, the mileage of new Ertiga is expected to increase. The petrol variant gives out ARAI-rated 19.34kpl and 18.69kpl for its manual and automatic transmissions, respectively. This is a significantly higher that the on sale model providing 17.50kpl for the manual and 17.03kpl for the automatic version. The diesel version of new Ertiga is also more frugal. It also gives out an average of 25.47kpl in comparison to the 24.52kpl of its predecessor.